For the record, I am totally convinced that if you want a handbook on how to live a good, fulfilling life – one should look no further than always-oh-so-inspiring Ralph Waldo Emerson’s writings. Don’t believe me? Try this sampling of quotes on for size, all of course written and so graciously shared by Emerson. and lastly, “Scatter Joy” …. it has become my mantra of sorts this year. 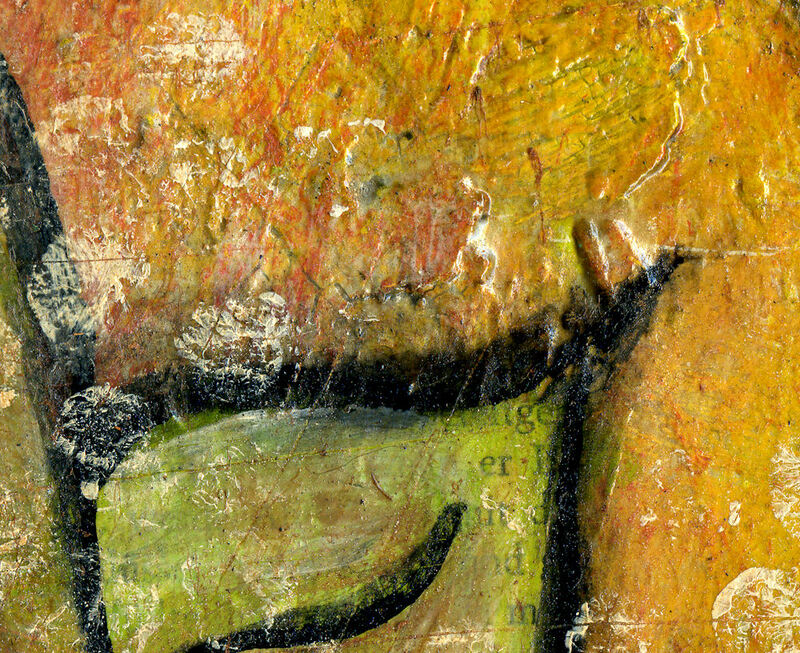 Detail in Scatter Joy: Click to see larger. I have mentioned several times how this last year has been one of my roughest ever.. day after day I have been faced with extreme emotional challenges, physical ones and the struggle of once again starting my life anew. It’s a bizarre sort of thing really – for as much pain as I have endured, a part of me absolutely thrives on the challenge – and really, which of us hasn’t had our lives torn apart a bit, only to begin anew? I am also grateful that I have been given this time to learn who I am, and just what I am made of .. and should I forget that, should i forget all the good this world holds for me, should i forget the choices I have in front of me… I have the words of Emerson to remind me. .. and I have art. 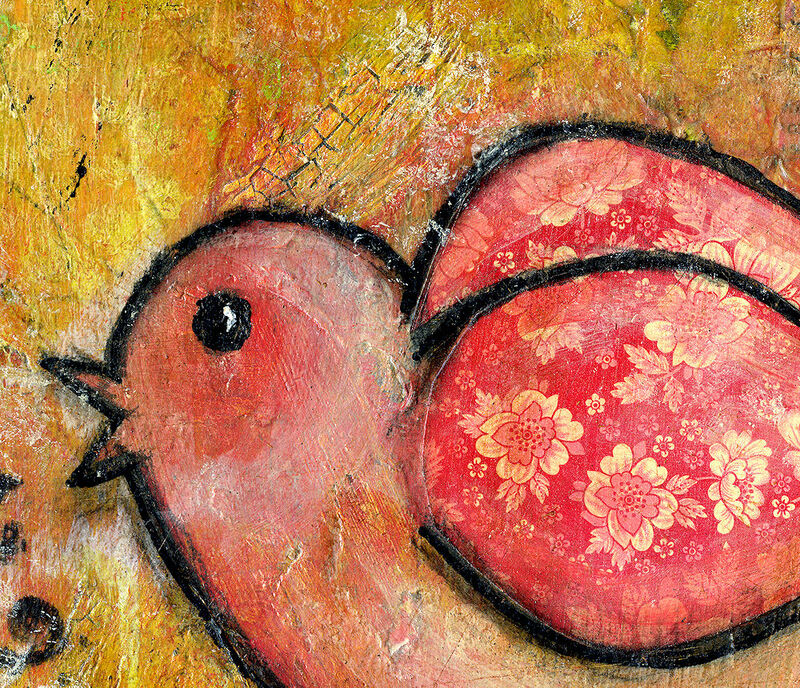 Detail of Scatter Joy Birdie: Click to see larger. Despite some heavy depressions, lots of cursing and a few really dim days … I have been creating these wonderfully vibrant pieces, full of color and light.. whimsy and happiness.. full of.. well, good ol’ fashioned optimism. How amazing is that? It is rare I plan out a painting.. I typically crank up the music and allow whatever that magic is inside me to come forth, to emerge. I create with wild abandon, with a huge heaping of freedom, and without judgement… the final result is often eye-opening to me and more beneficial than any 50 minute session with a therapist could ever be. I have discovered, or more accurately- been reminded – of what an incurable optimist I am at heart .. even when the times are more than a bit tough. Sounds so simple doesn’t it? Yet, it is life changing for me. The piece I have shown throughout the post here is aptly named “Scatter Joy”, I threw a good chunk of myself into it & got lost in the magical little world I created … it contains well over 85 layers (i stopped counting there). 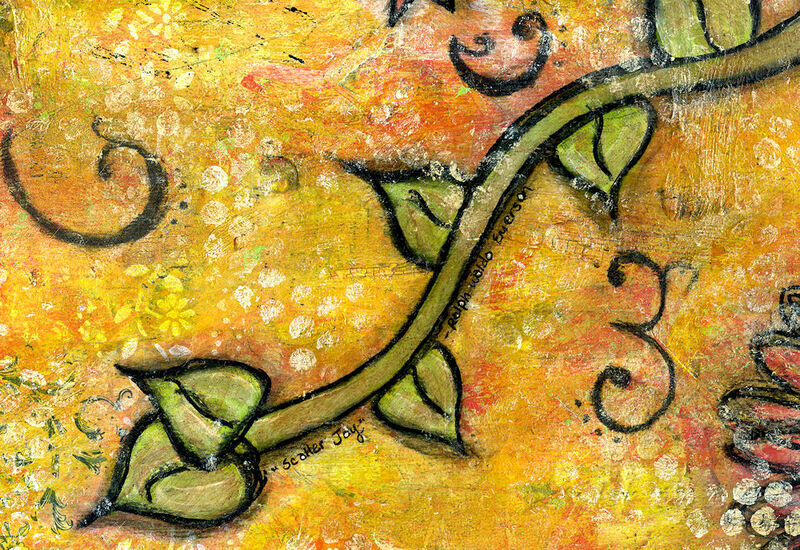 It is one of the pieces that are dear to me, and one that is difficult for me to part with.. it is up for sale, and on sale at etsy .. and if you decide it holds a deep meaning for you too, I will give you $100.00 back on it – if purchased by Saturday, October 17th … just tell me you heard i ton my blog when you check out. With that, I am ending here.. before I change my mind! I know just what to do with my time.. paint, paint with creative abandon. P.S. I still have some practically free yarn lots left, and the pre-order deal on the 8×10 of knowing is expiring soon! P.P.S. What is your favorite Emerson quote? Share it by Saturday October 17th, and you just may win an Artography print of mine! I am sure I could not pick just one Emerson quote. Here are a couple of my favs. Ralph Waldo Emerson has to have been one of the most brilliant men to have ever lived. Thank you for giving us some of his quotes! There are many more I like, but I think this one pretty much sums up how we’d like to live our lives. I love this piece and whoever buys it will surely possess a treasure! Live in the sunshine, swim the sea, drink the wild air is my most fave. There are so many good ones. Don’t waste yourself in rejection, nor bark against the bad, but chant the beauty of the good.